First I want to say that many corporate (security) sympathizers tend to defend private policing, but this article will debunk all their arguments here and show how private policing is the end-all end-game ultimate threat to freedom in America and humanity as a whole, all in the name of protecting corporate profits $$ while working hand in hand with government for their greater long term new world order plans. In 2014 I covered the rising threat of private security now arresting American citizens in the streets of America after witnessing firsthand the arrest of a gentleman in Hollywood California. The private security company looked very threatening with guns, bullet proof vests and the whole tyranny outfit. The frightening scene looked more like a SWAT military situation with around 10-15 fully armed agents and multiple nearly unmarked cars only there were no tanks or machine guns that I saw. To my chagrin, a closer looked showed that no police was present, all of this was being done in the name of private police! Since this article and accompanying video I've been attacked by some with comments claiming this is no big deal, that I'm exaggerating, an idiot, a fool and that I don't know what I'm talking about because private security is a good thing. Let's take a look at the issue more closely. The early twentieth century might be thought of as a golden age of private detective firms. The Pinkerton Agency, for example, is credited with influencing the development of investigation techniques used by the public police through its systems of surveillance and its development of a file system that was used by the Federal Bureau of Investigation until it developed its own case file system (Sklansky 1999; Draper 1978; O’Reilly and Ellison 2004). Indeed, it was not until the 1930s that private security stature and legitimacy came to be questioned. A significant event in this process was the establishment of the La Follette Committee to investigate threats to civil liberties (particularly labor-related threats) associated with the private security industry. A particular cause for concern was Pinkerton’s use of espionage techniques and other methods to break strikes and monitor industrial activities. As you can see, back in the 1930's private security was already corrupt helping police and government to spy on citizens illegally. All in the name of profits and long term government agenda. Even back then, the citizens were the enemy and government agenda and profits were the goal. Since way back then up to this day private security is sold to Americans as a tool for "safety" and this is a lie we'll deal with later. One thing that should concern all American citizens is the rate of growth of private security/police. According to a series of reports by Hallcrest known as ”Hallcrest Report I: Private Security and Police in America” and ”Hallcrest Report II: Private Security Trends 1970-2000,” which were published in 1985 and 1990 respectively, private security back then already outnumbered public police by about 3:1 ratio. Similarly, according to Wikipedia by 1990 private security constituted three quarters of all police in America. So without a doubt the concept of private security is looked upon favorably by government who always works with corporations to get their agenda done. This exponential rising of private security should alarm everyone that it is all by design not by coincidence. The argument of "free enterprise" cannot be applied here. This is policing of we-the-people, it fits in with government's desire to control the people and government has been involved in this growth from the beginning working hand in hand with private security unlike a service or product that is truly a result of the free market. Undeniably, private police expand exponentially the amount of police personnel available to control, surveil, snitch, report, punish, arrest, fine and detain civilians. This exponential policing plays into the police state and the new world order plans perfectly. Despite all of this, some people who defend private policing are resorting to same handful of excuses to rationalize or justify the need for private police. Here are some of the claims made. Those that defend private policing claim that private police are more trust worthy than public police. This is an ad hominem based on assumptions and not based on any actual evidence. This ad hominem excuse takes a known problem (police are corrupt) and uses this known problem to leap to an unproven conclusion- that private security must somehow be more honest. As noted above, private police had integrity and ethical issues going back to the early part of the 20th century and that has never changed. 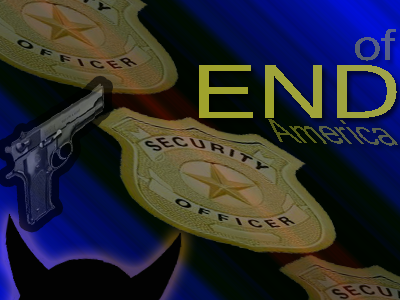 Private security benefited as much or more than any other industry after 9/11 and there is no reason to think they are honest, have integrity or have an incentive to look out for individual citizens and freedom. Let's not forget that private police do not take an oath to defend the U.S. Constitution. They are not sworn to protect citizens, they are sometimes (depending where they work) expected to defend "customers" but that is only related to 'customer relations' which is ultimately related to corporate profits. The idea that a group of people who only answer to a for-profit corporation can be trusted to defend basic human rights, human dignity, and freedom when it is clearly not in their job description or call of duty is entirely unrealistic and naive. 2- Private police serve the "greater good"
Those defending private policing claim that the private police, specifically those part of BID or Business Improvement Districts which are now being given the power to arrest American citizens on the streets serve the neighborhood and act as good ambassadors. They argue as if private security is a virtuous well meaning entity only interested in peace and love. Where have we heard this before? Government has been claiming this for years- 'Government is good, government cares about you...' and so on. And anyone paying attention knows these are just lies to pacify anyone stupid enough to think that government (or private security) actually cares about you. Thus the private security/private police advocates are playing the exact same card claiming it's for the greater good of the neighborhood and it's all lies and theater. They operate for the greater good of profits and to support the rising police state and new world order nothing else. As for the actual private security officers, the foot soldiers on the streets, they are being lied to just like our military is lied to. The illusion that public police are lied to and military are lied to for the greater agenda but that somehow private police are not lied to, is naive and ignorant. Those defending private policing are thus only seeing the narrow picture and ignoring what is really happening with the rise of the police state and tyranny. That's the police state and the rising tyranny that their bosses won't tell them about. Their job, just like the military, is to shut up and do as they are told. When will people finally realize that it's ALL about money and power? 3- Private police/security keep neighborhoods "safe"
This brings up the importance of distinguishing between "feeling" safe versus actual crime drops. Yes people "feel" safer with private security but is this based on any reality? Doesn't the control system deliberately keep the people in fear in order to justify more and more policing, all for your supposed own "safety"?? If you ask me, constitutionally speaking, citizens have the right to protect themselves and provide their own safety. If we needed to be kept safe from danger this is all the more reason for average citizens to exercise their 2nd Amendment rights to bear arms. The notion that you need to be kept safe by a 3rd party for-profit group of people is a joke and a deception to justify the police state while increasing profits. With that said, studies have been done in the past evaluating the crime drop effect of the Guardian Angels in the 1970's in San Diego. At least one study showed that the neighborhoods not policed by the Guardian Angels showed LESS crimes than those policed by the Guardian Angels. As expected people said they felt "safer" and "property" crime specifically dropped. They seem to cut crime a bit. The most detailed research on their activities compared an area of San Diego patrolled by the Angels with a part of the city where they were absent. Surprisingly, violent crime fell more in the “ordinary” area than in the one patrolled by the Angels. But property crime fell much more in the area where the Angels operated. One finding though, was unequivocal: 60% of residents said they felt safer thanks to the youngsters' presence. Once again, this serves as a reminder that the "safety" sold by these private for-profit corporations is about keeping property safe not people safe. It's also about giving private for-profit corporations LEGAL power over you. It's a corporate takeover in many ways. Corporations have long wanted this power and more than ever now they see a chance to truly have power over you. The fact of the matter is that once we accept the concept of private police roaming the streets of America with power to arrest and detain as the private military corporation Blackwater had in Iraq, the sky is the limit for these corrupt corporations working with government as we saw with Blackwater aka Academy, XE. Remember, as with Blackwater/Academy/XE there is no guarantee that these private police will do what is moral, ethical, or what is right because they are entirely unregulated and unaccountable to the public. They only answer to a corporate for-profit entity. If you think public police, who actually take an oath to defend the Constitution, are corrupt, wait till the UN-accountable private police mafia becomes the norm. Corruption is a human problem not a public police problem and it is everywhere and any American who naively accepts this new private police paradigm is literally signing off on the end of America. Do not confuse the concept of private militias with private corporate for-profit police. Huge difference! Some people are trying to defend private police by painting them out to be equivalent to the militia "for the people". Don't go for this. The idea of a militia, which not surprisingly the government opposes (think Bundy Ranch standoff), is designed to guard the people of the republic from a tyrannical government. Private police on the other hand, are contributing to the concept of tyrannical government and would never align themselves against a corrupt government. Ask yourself, why is our government so eager to give power to private police? So eager the practice goes back over 100 years? Why are private police never portrayed by the mainstream media as un-American, potential threat to freedom or a potential terror threat like they portray the militias?? If and when it all goes down (SHTF), if and when order is lost and tyranny and martial law completely takes over, you can be sure all of these unregulated, unconstitutional private security working for these for-profit corporations endorsed by big government will act as an extension of government. Anyone who thinks otherwise is fooling themselves. The rise of these never-to-be-trusted for-profit private police with the power to arrest is thus a major threat to America any way you look at it and every American better be ready and do what you can now to oppose this course we are on. Those defending this agenda, like those who defend endless war and fake terror will argue violently to defend both their profits and the long term agenda that guarantees them a seat at the table of power and tyranny so don't be fooled. Don't forget that Hitler had his private police also who operated under private rules and committed atrocities. Private mercenaries have arguably a bloodier history than public police and armies. The lessen to learn here is that humans can be corrupt and humans under the control of a tyrant or tyrannical empire will do as they are told. Psychology experiments have proven this over and over again. Humans will do as they are told even if it means harming, illegally detaining, arresting, even torturing or murdering someone in the name of "I was told to do it". So as the rise of the nearly invisible threat of private police continues in America let's remember the past days when it was 'only' the public police killing the innocent and the general public was able to identify public police corruption and stand up to it. Let's remember how bad it was when the "regulated" police was killing everyone without consequences. Let's remember when the evil and corruption was still quantifiable because when the rise of private police is done, the corruption and evil will be so impossible to stop or even quantify that we will all be in danger. Just imagine how easy it will be for big government to reach into your life when anyone can don a uniform and claim to be "private police". This is the same government who has created, armed and funded Al Qaeda and ISIS. Think about this- What will you do when private police begin to wear masks to hide their faces for "protective" reasons just like the riot police do now? What about when a few false flags result in the new regulation that allows private police to have military gear? Get the picture? Anyone who thinks this is not the road we are on is lying to you and to themselves and probably just defending private security and private police profits. Consider that since 9/11 the U.S. has spend billions of dollars on so called Private Military Corporations or PMC's. If the U.S. government is willing to fund privatization of murder in other countries why would they not do it at home? Think. Who are these companies who are being given the authority to arrest U.S. citizens in the streets of America? What ties do they have to government? This was in the plans all along. So what will you do when the day comes that someone knocks on your door and it's not the police? They're armed, they're scary and they're looking for you but it's not police, it's outsourced private police. Who will you turn to then? In the end, this is all part of the new world order where the life and freedom of the individual is expendable. Where the individual has no rights and is just a pawn in a bigger scheme of profits, power and control. Speak up now or forever hold your peace. The takeover is underway from within, can you hear the footsteps coming? Can you see the cage with your name on it from here? Or perhaps you can see your name on that tombstone with the words engraved "Live free or die".